Analysis: As the Senate GOP wrestles with the increasingly complicated politics of Brett Kavanaugh's Supreme Court nomination, it’s getting even harder to envision him winning confirmation. As Republicans wrestle with the increasingly complicated politics of Brett Kavanaugh's Supreme Court nomination, it’s getting even harder to envision him winning confirmation. That’s true for those who think his chances have dipped far below 50 percent, and even for some who once thought he was a sure thing but now see a slight chance that he withdraws or loses a Senate floor vote. On the odds-making site PredictIt, shares of Kavanaugh becoming the next Supreme Court justice have dropped 4 cents to 32 cents, compared to 68 cents for his nomination failing. And even as the White House and the Republican National Committee maneuvered to undercut new allegations of sexual misconduct against Kavanaugh, a White House official told NBC News on Sunday night that there are no plans to back out — the kind of tepid endorsement that sometimes precedes the abandonment of an embattled nominee or administration official. Andrew Napolitano, a former New Jersey judge and legal analyst, said on Fox Business on Monday morning that the fate of Kavanaugh's nomination doesn't rest on whether he can disprove the claims against him — which he denies — but whether he or his first accuser, Christine Blasey Ford, is more believable on Thursday, when they are scheduled to testify before the Senate Judiciary Committee. "It's a case of lasting impressions," Napolitano said. "Is Judge Kavanaugh so damaged that he will lose if it's a tie?" If it becomes more politically or morally painful for a handful of Republican senators to vote for him than to kill his nomination quietly without a vote, the denouement of the Kavanaugh saga will be a quick whimper of withdrawal. But some of Kavanaugh’s supporters warn that the political calculation isn’t that simple. Matt Schlapp, who travels the country talking to Republican activists in his role as chairman of the American Conservative Union, said there will be a “meltdown” in the GOP that could doom the party in the midterm elections if Kavanaugh isn’t confirmed. “Any disruption in support of Kavanaugh will harm their ability to win races and depress activists,” he said in a telephone interview with NBC News on Sunday night. Trump’s Supreme Court picks — Kavanaugh and Justice Neil Gorsuch — have helped bond together an uneasy coalition of Trump’s base, longtime Republican activists and GOP establishment-types, he said, adding that the president “understands the politics” of that better than anyone. “Donald Trump is not going to back away from his Supreme Court nominee because of these types of allegations,” said Schlapp, who is a friend of Kavanaugh's, and whose wife Mercedes Schlapp is an aide to Trump. Senate Majority Leader Mitch McConnell, R-Ky., suggested last week to conservative activists that it doesn't really matter what Ford says in her testimony Thursday. Kavanaugh will be confirmed, he said: "We're going to plow right through it." And yet, Sen. Ted Cruz, R-Texas, a member of the Judiciary Committee who is in a tough re-election fight, said in a debate last week that there are "absolutely" things Ford could say during her testimony that could alter his support for Kavanaugh. Cruz declined to go into detail, but he struck a careful tone. 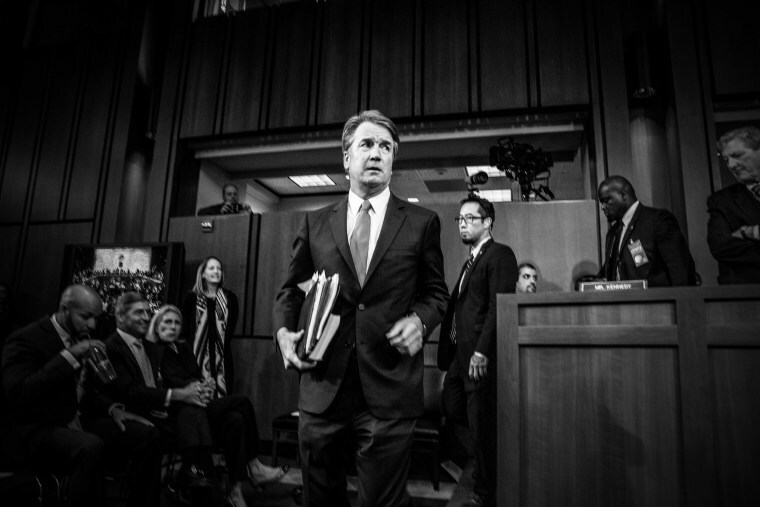 "The allegations she's raised are serious, and they deserve to be treated with respect," he said, adding that Kavanaugh should be allowed to defend himself. Many Republican senators have become more cautious — or fallen silent altogether — while the nomination twists in the wind, content to let Trump, McConnell and Judiciary Committee Chairman Chuck Grassley, R-Iowa, take on the roles of Kavanaugh's chief public defenders. While much of the media attention has focused on four Republican senators — Jeff Flake of Arizona, Susan Collins of Maine, Lisa Murkowski of Alaska, and Bob Corker of Tennessee — that's because they have, in various ways, indicated discomfort with moving toward a vote on Kavanaugh before hearing from Ford. What's clear is that he doesn't have the 50 votes needed for the confirmation to be considered in the bag. The key questions are how far short is he right now, and what it would take for him to secure the remaining GOP senators amid the allegations. "Here’s the problem for Republicans," Amanda Carpenter, a former Cruz aide and author wrote on Twitter. "Who is happy about moving forward? Who is willing to tank him? It’s a dead zone." On a political level, that's less of a conundrum for the Republican senators who occupy relatively safe seats and have no presidential ambitions. For them, a backlash from conservative voters is a much bigger fear than the possibility of alienating moderates. They don't need to be told that they could face primary challengers if they anger the GOP activists, and that means a vote for Kavanaugh is the best outcome even if the nomination fails on the Senate floor. But for GOP senators who fear losing their seats to Democrats — or for those who want to run for president in 2024 or beyond — the obvious calculation is that they may be best served if they avoid a vote altogether without having their fingerprints on the abandonment of Kavanaugh. They want to win. That’s why it’s so hard to see him doing the same.